The Shimabara Rebellion(島原の乱,Shimabara no ran) was an uprising that occurred in the Shimabara Domain of the Tokugawa Shogunate in Japan from 17 December 1637 to 15 April 1638. The Shimabara Domain was a Japanese domain of the Edo period. It is associated with Hizen Province in modern-day Saga Prefecture. Matsukura Katsuie was a Japanese daimyō of the early Edo period. As the son of Matsukura Shigemasa, Katsuie was notorious for suppressing Catholics in his domain, setting high taxation and assigning intensive labour to its peasants, later causing the Shimabara Rebellion. He was also infamous for dressing disobedient peasants in straw overcoats and then setting them on fire. Matsukura Shigemasa was a Japanese feudal lord of the late Sengoku and early Edo periods. He held the title of Bingo no Kami and the Imperial court rank of junior 5th, lower grade. Though he began as a retainer of Tsutsui Sadatsugu of Yamato Province, he became a lord in his own right, acquiring the 60,000 koku Shimabara Domain in Kyushu, in 1600. He is most famous for being the lord whose domain was the center of the Shimabara Rebellion of 1638. 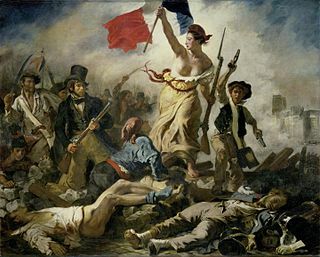 Following the successful suppression of the rebellion, Shirō and an estimated 37,000 rebels and sympathizers were executed by beheading, and the Portuguese traders suspected of helping them were expelled from Japan. Katsuie was beheaded for misruling, becoming the only daimyō to be beheaded during the Edo period, and the Shimabara Domain was given to Kōriki Tadafusa. Japan's policies of national seclusion and persecution of Christianity were tightened until the Bakumatsu . Kōriki Tadafusa was a daimyō under the Tokugawa shogunate in early-Edo period Japan. Shimabara Peninsula is east of Nagasaki City, Nagasaki Prefecture, Kyūshū, Japan. On its north-eastern tip stands Shimabara City. Amakusa (天草), which means "Heaven's Grass," is a series of islands off the west coast of Kyushu, the southernmost of the four main islands of Japan. Karatsu Domain was a Japanese domain of the Edo period. It is associated with Hizen Province in modern-day Saga Prefecture. Shimabara was once the domain of the Arima clan, which had been Christian; as a result, many locals were also Christian. The Arima were moved out in 1614 and replaced by the Matsukura. The new lord, Matsukura Shigemasa, hoped to advance in the shogunate hierarchy, and so he was involved with various construction projects, including the building and expansion of Edo Castle, as well as a planned invasion of Luzon in the Spanish East Indies (today a part of the Philippines). He also built a new castle at Shimabara. As a result, he placed a greatly disproportionate tax burden on the people of his new domain and further angered them by strictly persecuting Christianity. The policies were continued by Shigemasa's heir, Katsuie. The Arima clan was a Japanese samurai clan. Edo Castle, also known as Chiyoda Castle, is a flatland castle that was built in 1457 by Ōta Dōkan. It is today part of the Tokyo Imperial Palace and is in Chiyoda, Tokyo, then known as Edo, Toshima District, Musashi Province. Tokugawa Ieyasu established the Tokugawa shogunate here. It was the residence of the shōgun and location of the shogunate, and also functioned as the military capital during the Edo period of Japanese history. After the resignation of the shōgun and the Meiji Restoration, it became the Tokyo Imperial Palace. Some moats, walls and ramparts of the castle survive to this day. However, the grounds were more extensive during the Edo period, with Tokyo Station and the Marunouchi section of the city lying within the outermost moat. It also encompassed Kitanomaru Park, the Nippon Budokan Hall and other landmarks of the surrounding area. 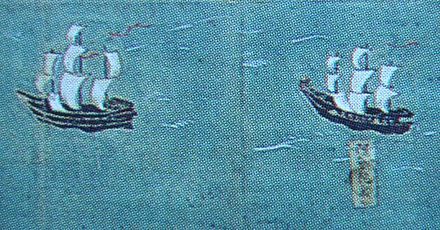 The inhabitants of the Amakusa Islands, which had been part of the fief of Konishi Yukinaga, suffered the same sort of persecution at the hands the Terasawa family, which, like the Matsukura, had been moved there. Other masterless samurai in the region included former retainers of Katō Tadahiro [ ja ] and Sassa Narimasa, both of whom had once ruled parts of Higo Province. 1 2 3 "WISHES". Uwosh.edu. 1999-02-05. Retrieved 2018-04-15. 1 2 Morton, Japan: Its History and Culture, p. 260. ↑ Gunn, Geoffrey (2017). World Trade Systems of the East and West. Brill. p. 134. ISBN 9789004358560. ↑ "Karatsu domain on "Edo 300 HTML"" . Retrieved 2008-10-05. Amakusa Shirō, also known as Amakusa Shirō Tokisada (天草四郎時貞), often romanized as Shirou, led the Shimabara Rebellion, an uprising of Japanese Roman Catholics against the Shogunate. They were defeated, and Shirō was executed at the age of 17, and his head was displayed on a pike near Nagasaki. Since the late 20th century, he has been featured in popular culture as a character in numerous manga, anime, and video games. Shimabara Castle, also known as Moritake Castle and Takaki Castle, is a Japanese castle located in Shimabara, Hizen Province. 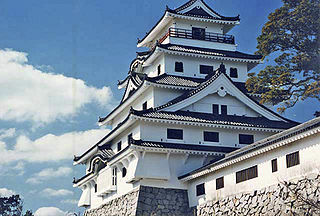 This five-story white building stands in stark contrast to the black Kumamoto Castle in neighboring Kumamoto Prefecture. Karatsu Castle is a Japanese castle located in Karatsu, Saga Prefecture, Japan. It is a hirayamajiro, a castle built on a plain rather than a hill or mountain. At the end of the Edo period, Karatsu castle was home to the Ogasawara clan, daimyō of Karatsu Domain. It was also known as "Dancing Crane Castle". Minamiarima was a town located in Minamitakaki District, Nagasaki Prefecture, Japan. Maruoka Castle is a hirayama-style Japanese castle located in the Maruoka neighbourhood of the city of Sakai, Fukui Prefecture, in the Hokuriku region of Japan. It also called Kasumi-ga-jō due to the legend that whenever an enemy approaches the castle, a thick mist appears and hides it. Built at the end of the Sengoku period, the castle occupied by a succession of daimyō of Maruoka Domain under the Edo period Tokugawa shogunate, the site is now a public park noted for its sakura. The Satake clan was a Japanese samurai clan that claimed descent from the Minamoto clan. Its first power base was in Hitachi Province. The clan was subdued by Minamoto no Yoritomo in the late 12th century, but later entered Yoritomo's service as vassals. In the Muromachi period, the Satake served as provincial deputy (shugo) of Hitachi Province, under the aegis of the Ashikaga shogunate. 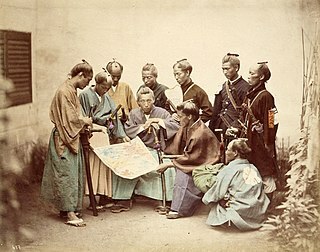 The clan sided with the Western Army during the Battle of Sekigahara, and was punished by Tokugawa Ieyasu, who moved it to a smaller territory in northern Dewa Province at the start of the Edo period. The Satake survived as lords (daimyō) of the Kubota Domain. Over the course of the Edo period, two major branches of the Satake clan were established, one ruled the fief of Iwasaki, the other one the fief of Kubota-Shinden. Minamishimabara is a city in Nagasaki Prefecture, Japan. It occupies the southern tip of Shimabara Peninsula. Amakusa 1637 is a shōjo manga written and illustrated by Michiyo Akaishi. It is about the time-traveling adventures of six modern-day Japanese high school students from the St. Francisco Academy to the 17th century, where they take part in the Shimabara Rebellion. It was serialized in the manga magazine Flowers from 2001 to 2006 and collected in 12 tankōbon volumes. The Itakura clan is a Japanese clan which came to prominence during the Sengoku period. The family claimed descent from Shibukawa Yoshiaki, the son of Ashikaga Yasuuji, a relative of the Ashikaga shōguns. Over time, the clan evolved into several branches which were daimyō, ruling the Bitchū-Matsuyama, Niwase, Fukushima, and Annaka Domains. 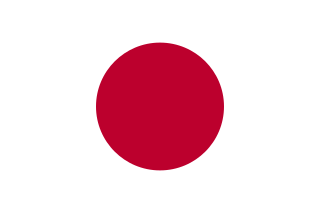 The Niwase Domain was a Japanese domain of the Edo period. It was associated with Bitchū Province in modern-day Okayama Prefecture. Annaka Domain was a feudal domain under the Tokugawa shogunate of Edo period Japan, located in Kōzuke Province, Japan. 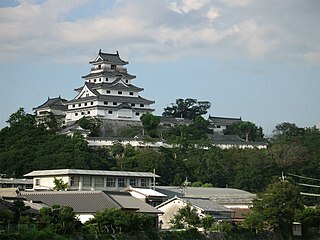 It was centered on Annaka Castle in what is now the city of Annaka, Gunma. Matsudaira Nobutsuna was a Japanese daimyō of the early Edo period, who ruled the Kawagoe Domain. First serving Tokugawa Iemitsu as a page, Nobutsuna was renowned for his sagacity. 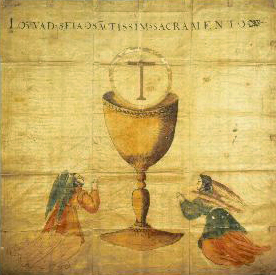 He was named a rōjū in 1633. Nobutsuna led the shogunal forces to their final victory over the rebellion at Shimabara. His court title was Izu no Kami, which was the origin of his nickname, "Izu the Wise". Itakura Shigenori was a Japanese daimyō of the early Edo period. Shigenori's daimyō family claimed descent from the Shibukawa branch of the Seiwa Genji. The Itakura identified its clan origins in Mikawa Province, and the progeny of Katsuhige (1542–1624), including the descendants of his second son Shigemasa (1588–1638), were known as the elder branch of the clan. Katsuhige was Shingeori's grandfather; and Shigenori was the eldest son of Shigemasa. 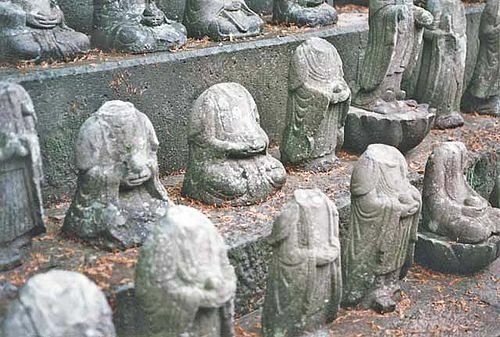 The history of Kumamoto Prefecture has been documented from paleolithic times to the present. Kumamoto Prefecture is the eastern half of Hinokuni, and corresponds to what was once called Higo Province. Exceptions are the part of Kuma District, which had once been part of Sagara Domain, and Nagashima which was included in Kagoshima Prefecture. Maruoka Domain was a feudal domain under the Tokugawa shogunate of Edo period Japan. It was based at Maruoka Castle in eastern Echizen Province in what is now the Maruoka neighbourhood of modern-day Sakai, Fukui. It was ruled during its history by the Honda clan, and subsequently by the Arima clan. "Karatsu domain on "Edo 300 HTML"" . Retrieved 2008-10-05.